In December 2011, Natalya and I were fortunate to have the opportunity to travel to South America for a holiday. In Argentina, we were able to fulfill all our foodie dreams of Argentine steak, chimichurri, and bold red wines. By the time we had crossed the Andean Lakes into Chile, we were completely beef-ed out and the cow population had probably taken a hit as well. Luckily, Chilean cuisine provided the perfect respite from our steak binge. The pure freshness of the raw fruits and vegetables were on a totally different level. Chile is blessed with a long north to south coastline with an immense geographic diversity that allows for many different crops and seafood to be a part of Chilean cuisine. The food of Chile took us completely by surprise. We were expecting to love Argentina and, to be honest, adding Chile to the itinerary was more of an afterthought. But we fell in love with the country and its food just after our first meal there — sometimes that’s all it takes! 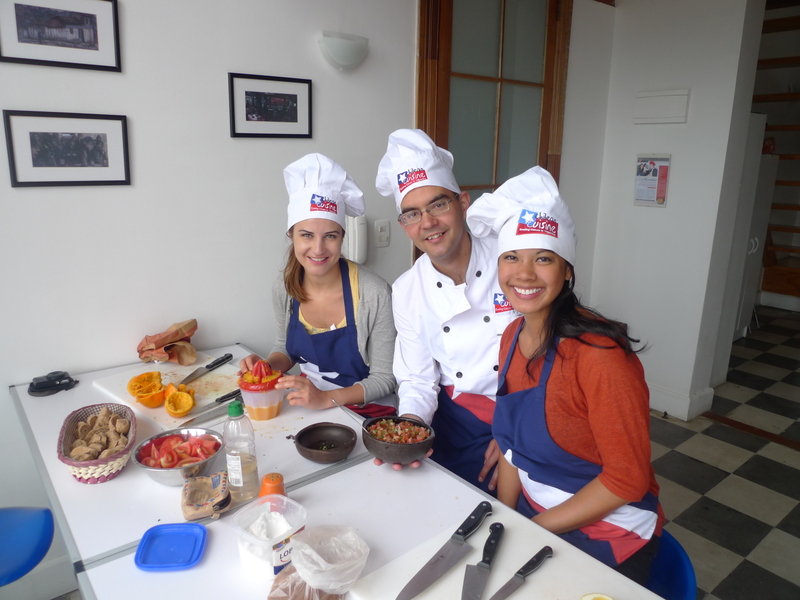 When we arrived in Valparaiso city, known as Chile’s cultural capital, our first order of business was taking a cooking class. I found the Chilean Cuisine Cooking Class via tripadvisor and signed up immediately. The cooking school is run by the owners of the Yellow House Bed & Breakfast and is located just across the street from the B&B. We met our teacher Andres at the top of Ascensor Artillería, where the Paseo 21 de Mayo provides a beautiful panoramic view of the harbor. From the lookout point, it was a short walk to the cooking school. The school is housed in a brightly-lit and spacious loft with a cozy kitchen and large windows that provide a gorgeous view of the port. Upon entering, we noticed the prep table was meticulously set up with cutting boards, knife sets, and a chef’s hat and a Chilean flag apron for each of us. After deciding on our menu with Andres, we headed down to the marketplace to buy some fresh produce and meats for our meal. Andres also acted as a walking tour guide along the way, pointing out local historical monuments and sharing interesting tidbits about the city. After we returned, we suited up in our Chilean flag chef gear and set about making our meal with a lovely Chilean music soundtrack. We made 5 dishes with a perfectly timed Pisco Sour break in the middle. With the lovely bottle of Carménère enjoyed with our meal, this was definitely our kind of cooking class. Andres was a delight and it was a terrific experience overall. It wasn’t until late afternoon that we finally took our leave with our leftover empanadas and our newly acquired Chilean flag apron. 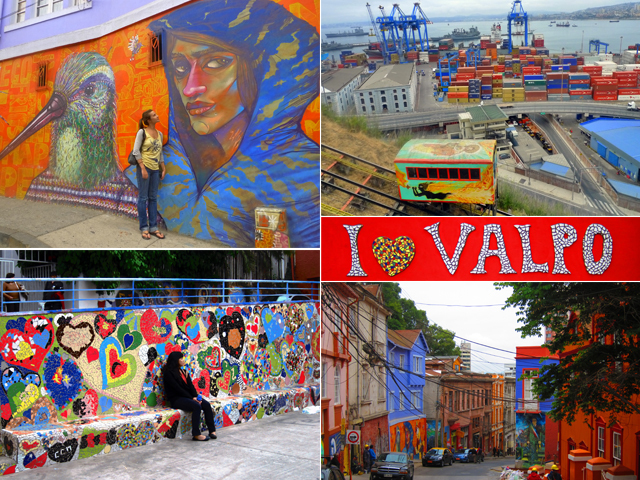 This is a definite must-do activity if you are ever in Valparaiso. 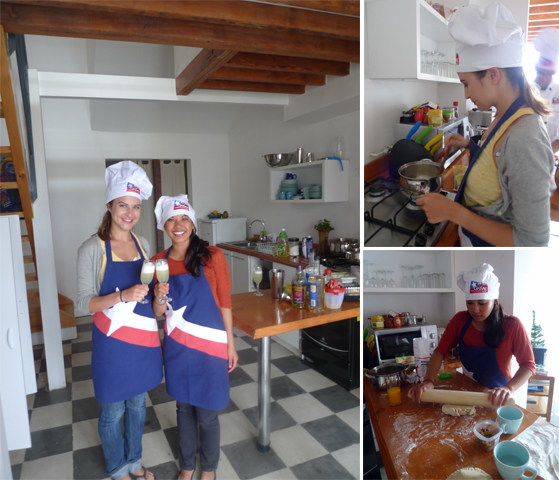 For more ideas on South American cooking, check out the Peruvian Cooking Class Natalya did in Lima! Our menu is detailed below. Click on each photo or title for the recipe. Pebre is a Chilean condiment made of olive oil, garlic, onion, cilantro, and spicy peppers. This sauce is great for soups, stews, seafood and steaks. If you add chopped fresh tomatoes, Pebre becomes the Chilean Salsa, Chancho en Piedra. This is simple salad is very popular in Chile; it is composed of tomatoes, onion, cilantro, and sometimes chile peppers. The national origin of this cocktail may be highly debated, but its frothy deliciousness is not. These flaky pastry morsels are often stuffed with cheese, but Chileans also like using the same stuffing as Pastel de Choclo: beef, onions, raisins, black olives, and hard boiled eggs. Custard apple, or chirimoya, is my new favorite fruit discovery. For this traditional Chilean dessert, pieces of chirimoya are marinated in orange juice and served chilled. I would love to go to Chile. Any pointers on the Corn Pie? However, I think the point of casseroles in general is to be very simple as it’s very much a working man’s type food. Therefore, that means you can take tons of creative liberties in the kitchen with fillings and ratios etc to fit your tastes. What I love about the fact that everything is already cooked before the final baking is that you can taste test many times along the way to tweak the flavors to your liking. I think you really can’t go wrong with the chicken, beef, onion, olives, raisins, hard boiled eggs combination. My favorite part is the corn dough and caramelizing it with sugar when you bake it is a must!! Agreed, casseroles should be unfussy, I think that’s what’s appealing. I’m getting hungry, so time to leave work.